Is protecting the whole universe really someone’s job? 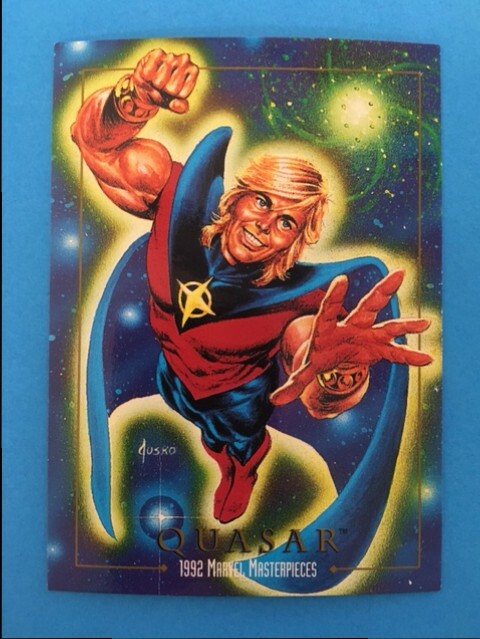 Yep, and his name is Quasar (originally Wendell Vaughn). 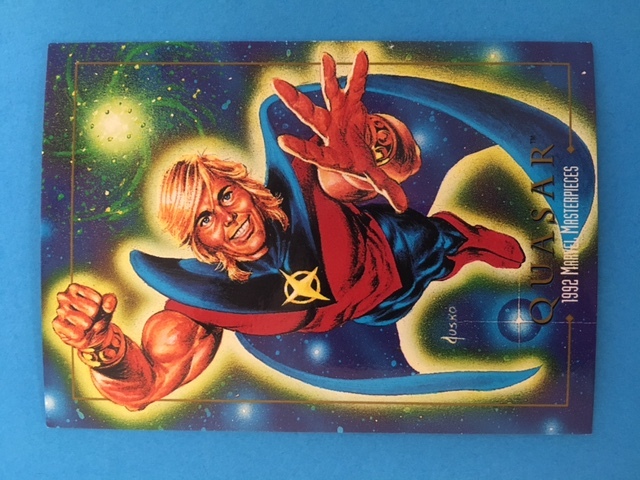 Gifted with quantum bands, Quasar can manipulate quantum fields and travel at superluminal speeds. According to his card, he can create solid objects out of cohesive energy – so basically he is an interstellar sculptor flying through space faster than the speed of light. Okay, but what can this mean in the context of art and creativity? In honor of Quasar, lets talk about both speed and spatiality in the artistic process. The speed at which artists create varies greatly. Some, like the late Kent Bellows, work very slow and meticulous, logging hundreds of hours in each work they produce. Others rely on intuition and immediacy to express a work in minutes. Picasso is touted for creating over 50,000 original works of art in various mediums over the duration of his 91-year life. That works out to about 1.5 artistic creations per day! There are also tools like pottery wheels that help ceramicists convert speed into form. Different speeds of expression create different results, so depending on what we are hoping to achieve, we can use the variable of speed intentionally. Considering spatiality, as a sculptor, Quasar would be free to travel and sculpt in any direction and at virtually any speed. As a moving point in space, he could mimic a 3D printer nozzle, leaving trails of sculpted micrometeorite space dust over extremely large swaths of space. He would also be sculpting without the tug of gravity, allowing him to create unique additive sculptures that include disconnected floating and moving parts. So… lets look at what role speed plays in our work and what adding or subtracting it in our process will do. Also, lets consider our work in space (even outer space) and what it would mean to add another dimension to our subject matter. How could we extend two-dimensional images into three-dimensions, or take a three-dimensional work and make it four-dimensional by adding motion/time.